ISO 14001:2015 Transition Vol 4. 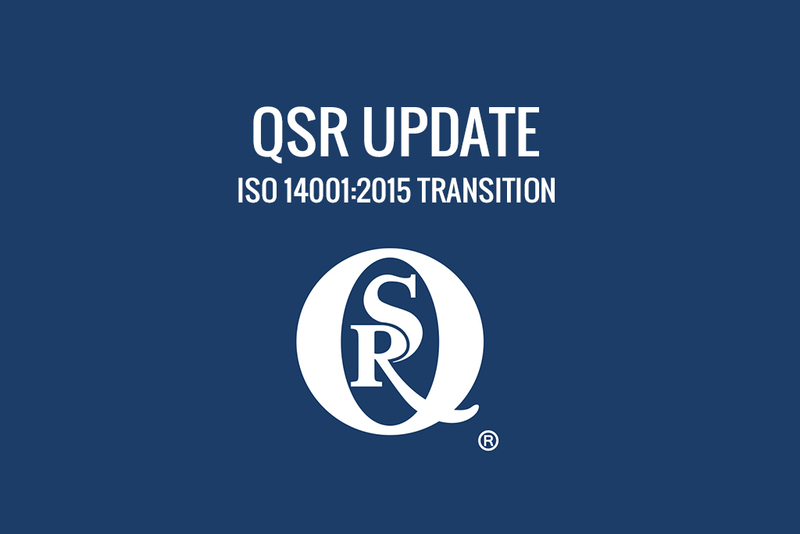 | Quality Systems Registrars Inc.
ISO 14001:2015 Transition Vol 4. December 23, 2015 Hello from the great warm Blue Ridge Mountains of Virginia! The bushes are thinking about blooming again! Don’t do it! Where’s winter…I have my fuzzy slippers out. Below is general information regarding ISO 14001: 2015 changes. Keep in mind that all revised standards are at least 30% the same (terminology, structure, requirements). Therefore much of the information from the previous newsletters apply. Just as ISO 9001 added, ISO 14001 has added risk based thinking. It has always been in the standard but now it is explicit. Also another significant change is Life Cycle Thinking. Think advanced product environmental (compared to quality) planning. Think about the front and back of the process and design a product that is well planned and environmental supported. Let’s get started! (Clause 4) You will be required to identify external and internal issues that may impact the ability of your EMS to deliver its expected outcomes. For example: environmental conditions that may affect or be affected by you. Also you are required to figure out what the needs and expectations of your interested parties are.- ie, those individuals and organizations that can affect, be affected by, or perceive themselves to be affected by, your decisions or activities. This part is very similar to the ISO 9001 requirements, it’s is just environmentally focused. This portion of the standard is the beginning of your risk based thinking and how you handle the expectations of your internal/external issues and interested parties. (Clause 5) Your top management is required to engage in the EMS activities as opposed to simply ensuring that the activities get done. No longer will QSR auditors ask “Skippy, do you have the responsibility and authority to herd the cats?” (While Skippy has to answer yes because he/she is amongst the top management and he/she just bought an environmentally conscience new car). This means there is a need for top management to be actively involved in the operation of your EMS and be accountable. (Clause 6) You must have evidence (documented information) that you have determined, considered, whined and, where deemed necessary and appropriate, taken action to address/mitigate risks and opportunities that may impact (either positively or negatively) your EMS´s ability to deliver its intended/expected outcomes. Once again references to ‘preventive action’ have poofed but the shadow remains and is strong in the force. Of course you know the overall idea is to identify potential risks, determine potential impact and mitigate as you can and review (management review) for possible other actions. (Clause 8) You will need to a) ensure that products are designed in an environmentally friendly/conscience manner, b) determine environmental requirements on products and services to be purchased and communicate them to your suppliers, and c) provide relevant information to customers. But just like risk based thinking, there is no requirement for a formal full tilt life cycle process. I take this as, be responsible think of others from the “head” to “toe” of your products. References to requirements for documents and records have been replaced by the term “documented Information”, which has to be “maintained” in the case of documents and “retained” in the case of records. Ok……now we will get to have discussions…did you mean retained or maintained? Y’all know what to do. So during the whole transition roll out and frenzy and depression and positives and so on…I have said do not throw the baby out with the bath water. I’ll say it again. No I won’t but you get it. Keep in mind you have an existing management system in good standing evidently because you are receiving these newsletters. Or maybe you are the new kid on the block…you still have a management system. That does not change, this is just a revision it’s not a new “math” thing. It’s not a new way to clean your house (can you tell where my mind is). So please do not start pulling everything out of the closet thinking you need to buy new. Below gives you a bit more information. Get rid of the management representative. While there is no requirement in ISO 14001:2015 for a management representative, this does not prevent you from choosing to retain the role if you wish. Trash those procedures, manual etc. that you worked so hard to create. You can do it…but why? Renumber/ Rename your existing documentation. I’ve had clients call and say “We want to renumber our documents for the auditor”…WHAT!!! No no no…make us work for it. If y’all want to for your sake..go for it. But not for us. And this is just a few examples for what YOU DO NOT NEED TO DO. We appreciate all the input and questions we get. Please keep them coming. I know several of you are almost ready to go with this. That’s wonderful. By the time this newsletter is out, some of you will have received your transition “window” date by email. We are also calling folks. Your time period could not be a full 3 years because all of our clients must be transitioned by 9/15/18. The 9/15/2018 means QSR had to back up the date to June 30, 2018 for all clients because we have significant work to do after an audit. The main work is ensuring your certificate does not go past 9/15/2018. With that said, the “window” may feel like you are trying to eat 30 hotdogs in 2 minutes because your timeline will be less than 3 years. This is happening throughout the ISO world. QSR is offering a 10% discount off the transition audit day rate, if your company agrees to transition earlier than your “window”. I say go for it, get it over with. I cannot say what your outcome will be and we all know management systems can get stinky over time BUT consider this: I have a lot of audits under my heels and I have only recommended 2 companies to not retain their certification. Please keep this thing in perspective. We sincerely appreciate y’all and if you have any questions or concerns do not hesitate to contact me. Also, with all the crazy going on in the world…I hope each of you and your families have a very wonderful, safe and blessed holiday season. I believe we still live in the most wonderful country in the wide world.